After thinking for a few days on what I wanted to make involving butter I settled on a sauce – a butter based sauce. I haven’t made too many in my day so I figured it’d be a challenge and good practice. Who better to consult for this task but Ms. Julia Child? So I read her chapter on Hot Butter Sauces and settled on beurre blanc – a classic sauce that pairs well with so many foods from fish to vegetables. I thought it seemed like a delicious, yet simple enough recipe to tackle for my very first blog post. 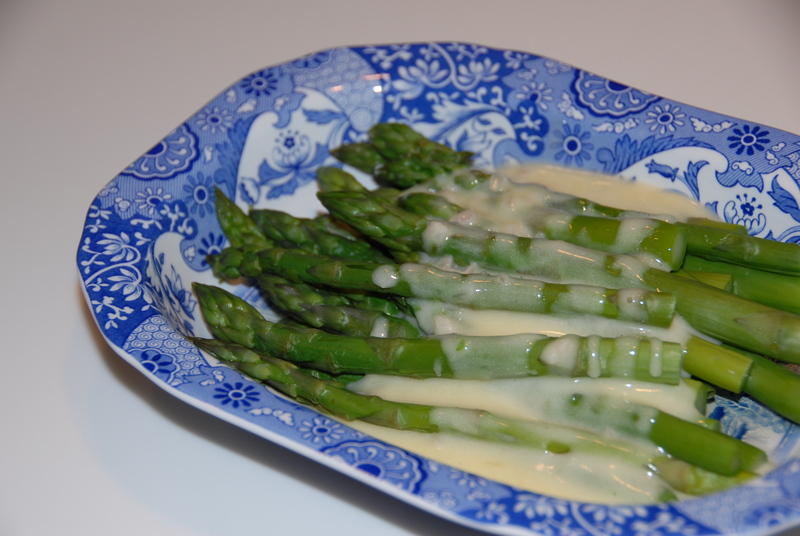 The plan went like this: steam some asparagus, make a nice creamy butter sauce, dive in. I guess I should have known better – so often things that are seemingly simple end up being anything but. Bring this to a boil and let it reduce a bit until about 1 1/2 tablespoons of syrupy liquid remains. Now for adding the butter (lots of butter.) 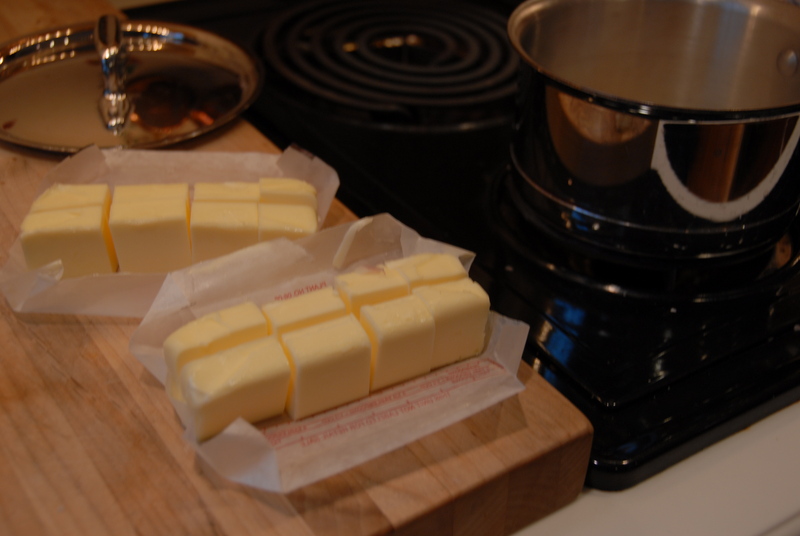 Have the 8 ounces (2 sticks) of butter cut up into 16 pieces ready to add. Wire whisk in hand. 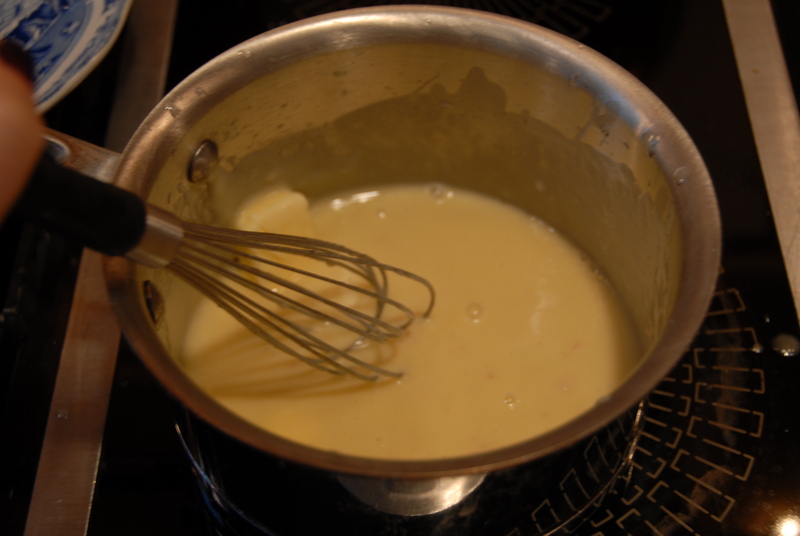 The trick to a beautiful beurre blanc is to make sure the butter does not turn oily – like melted butter. You want the sauce to be luxuriously think, warm and creamy. On my first, unsuccessful, attempt I used room temperature butter and kept the pan over high heat while adding the pieces and once I got through about half the butter it turned into hot, clear, liquidy butter. Not what I wanted. So I scratched the first attempt and went at the second, successful, attempt a little differently. Instead of room temperature butter I used chilled butter and I removed the pan from the heat before I started adding the butter piece by piece. Constantly beating the sauce with the wisk add 3 pieces of butter off the heat and then for the remaining pieces return the pan to a very low heat. The sauce remained thick and creamy and gave off the most amazingly rich aroma. Once I added all 16 pieces the sauce looked divine, I was quite pleased with myself, and it was ready to taste. I ended up adding a squeeze of lemon and a touch more salt for good measure. Upon completion I beamed at my shiny, velvety sauce – a tasty culinary classic, however, I couldn’t help but wonder how often one could eat this before keeling over in cardiac arrest. With that much butter involved I’m not sure I’ll be indulging on a regular basis but I did feel a little better pairing it with steamed asparagus. This entry was posted in Butter and tagged asparagus, beurre blanc, butter, vegetables, vermouth, wire whisk. Bookmark the permalink. Awesome blog! Added to the RSS feed! Keep up the good work! Loved your blog. I’m really looking forward to learning all of your adventures with food. this looks soooo yummy! and this is an awesome way to share all your kitchen talent-excited to see more!!! !